What are the 4 main steps in degradation of organic matter? What is the impact of incorporating organic matter into the soil? How does organic matter improve soil health? How can we increase the amount of organic matter content in soil? How does soil erosion affect organic matter in soil? How does tillage affect organic matter in soil? What is light fraction organic matter? How can I extract light fraction organic matter from my soil? How are organisms involved in composting? What happens during the composting process? What is compost maturity and why is it important? What are the main types of compost and what are their benefits? How does composted grape marc affect soil microorganisms? Question 1. What is organic matter? Organic matter is anything that contains carbon compounds that were formed by living organisms. It covers a wide range of things like lawn clippings, leaves, stems, branches, moss, algae, lichens any parts of animals, manure, droppings, sewage sludge, sawdust, insects, earthworms and microbes. By far the largest component is the dead matter - it constitutes about 85% of all organic matter in soils. 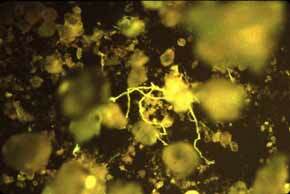 Living roots make up about another 10% and the microbes and soil animals make up the last few percent. Question 2. What are the 4 main steps in degradation of organic matter? In answering this question, we concentrate mainly on dead plant matter as this constitutes the major part of organic matter in soil (apart from living roots). However, the broad principles also apply to the degradation of animal and microbial matter. Breakdown of compounds that are easy to decompose - like sugars, starches and proteins. Breakdown of compounds that take several years to decompose like cellulose (an insoluble carbohydrate found in plants), lignins (a very complicated structure that is part of wood). Breakdown of compounds that can take up to 10 years to decompose - like some waxes and the phenols. This also includes compounds that have formed stable combinations and are located deep inside soil aggregates and are therefore not accessible to soil organisms. Compounds that take tens, hundreds or thousands of years to decompose include humus-like substances which are the result of integration of compounds from breakdown products of plants and those generated by microorganisms humus-like substances. Compounds in the first group are quick and easy for fungi and bacteria to decompose, so the carbon and energy they provide is readily available. Most of the microbes living in the soil have the enzymes needed to decompose these simple compounds. This type of decomposition is the first stage during the degradation of organic matter. Mites and small soil animals often help this stage by breaking up the organic matter into smaller pieces exposing more of the material to colonisation by bacteria and fungi. The second stage involves the microbes decomposing more complicated compounds - the second group listed above. Many, but not all, fungi and bacteria can decompose these compounds. The compounds take longer to decompose because they are much larger and they are made up of more complicated units than the compounds in the first group. Specific enzymes, not commonly produced by most microorganisms are required to break down these compounds. (photo van Vliet and Gupta). It's important to realise that decomposition will only take place if conditions are suitable. The rate of breakdown is greatly affected by the conditions in soil. There must be some moisture available, soil temperatures must be suitable (usually between 10 and 35°C) and the soil must not be too acidic or alkaline. Decomposition also occurs at higher temperatures, as in composts, or under waterlogged conditions. The types of organisms involved in breaking down the organic matter will depend on the conditions. Question 3. What is the impact of incorporating organic matter into the soil? All of these changes are related to the way organic matter is decomposed when it is incorporated into soil and to the particular type of organic matter used. When organic matter is incorporated into soil, the larger organisms like mites and soil animals break it into smaller pieces. Then the fungi and bacteria start to decompose it (they secrete enzymes to break up the chemical compounds it is made of). When the enzymes break the molecules into smaller sections, the bacteria and fungi can use some of energy or nutrients released for their own growth. For example, when an enzyme stimulates the breakdown of a protein, the microbe may be able to use the carbon, nitrogen and sulphur (if there is some) for its own physiological processes. Microbes can access nitrogen in the soil more easily than plants can, so the plants sometimes miss out. This means that if there is not enough nitrogen for all the organisms, the plants will probably be nitrogen deficient. This is why incorporating organic matter into soils can change the amount of nitrogen (and other nutrients) that is available to plants. These will be a short-term effect that happens when soils do not have high levels of organic matter and soil microbes. Question 4. What is humus? Humus is composed of organic compounds that are highly complex in structure. Like other organic matter, humus originates from dead organic material. The compounds that make up humus are highly complex organic compounds that have resisted decomposition and have accumulated in the soil. Humus organic matter is so altered that it can no longer be recognised as plant material. Question 5. How does organic matter improve soil fertility? The amount of organic matter in the soil is an important factor controlling the potential sustainability of a system. Soil organic matter plays a key role in supplying plants with the nutrients they require (especially nitrogen, sulphur and phosphorus). Organic matter also helps to improve soil structure, binds pollutants, and influences soil buffering capacity. Question 6. How can we increase the amount of organic matter content in soil? To maintain or improve organic matter levels we need inputs of new organic matter (from plant debris and/or animals) to exceed losses of organic matter by decomposition or erosion. Farming systems have traditionally ‘mined’ the soil for nutrients, causing soil organic matter levels to decline. This decline continues until management practices are improved. Question 7. How does soil erosion affect organic matter in soil? When soil is lost by erosion ﻿organic matter﻿, microorganisms and nutrients are also lost. Most animal waste and plant material (except deep roots) are returned to the soil at or near its surface. Soil ﻿organic matter﻿ therefore accumulates at the soil surface. The ﻿organic matter ﻿is food for microorganisms so they also concentrate in the surface few centimetres of soil. The loss of even a thin layer of soil during wind or water erosion results in a disproportionately large reduction in ﻿organic matter ﻿and microorganisms. This problem is increased in soils in the south west of Western Australia because they usually have poor soil structure and minimal plant cover during summer. Decreasing soil disturbance, creating wind breaks, maintaining crop cover or increasing clay content are all practices that can help to minimise soil loss. Question 8. How does tillage affect organic matter in soil? Large losses of soil ﻿organic matter ﻿can be attributed to cultivation. Organic matter that is inside aggregates or coated with soil particles is protected by decomposition because microorganisms are unable to come into physical contact with it. Tillage disturbs the soil and brings "protected" organic matter in to physical contact with microorganisms, which then decompose it. No-till systems can overcome this problem. No-till systems also decrease soil erosion. Organic matter and microorganisms are restricted to the top layers of the soil. This increases the potential for losing organic matter if management practices cause soil loss. Question 9. What is light fraction organic matter? Light fraction organic matter is the recently added and partially decomposed organic matter. It is called "light" fraction organic matter because it floats on the surface of water. 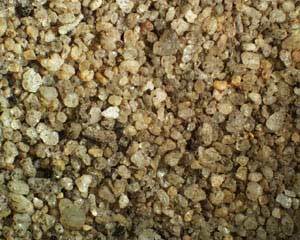 This distinguishes it from organic matter that has been in soil longer, which is denser and sinks in water. Question 10. How can I extract light fraction organic matter from my soil? A simple method to extract light fraction organic matter. Collect a sample of surface soil with a piece of PVC pipe (5 cm long). Crush soil to destroy aggregates and remove organic matter larger than 2 cm. Put the remaining soil into a 2 L drink bottle ans add water to approximately two thirds of the way up the height of the bottle. Shake vigorously for 1 minute. Lay bottle on its side and slowly roll back and forwards like a rolling pin for one minute. Slowly tilt the bottle upright, fill with water and allow to settle overnight. After settling overnight, the water should be clearer as the mineral particles and denser organic matter have settled. The small pieces of organic matter floating on the surface are light fraction organic matter. Cut the bottom out of a plastic conainter and secure a handkerchief over one end with an elastic band. Pour the light fraction organic matter floating on the surface through the handkerchief filter. Question 11. What is compost? Compost is the semi-stabilised product obtained after organic materials have undergone biological degradation under controlled conditions. Basically, compost is organic matter. Compost can be made from any organic material such as garden waste, food scraps, manure, sewage effluent, sawmill waste, leaves and cardboard. Composts vary greatly depending on their maturity, the organic materials used to make the compost, the type of composting (aerobic/anaerobic) and length of the composting. Question 12. How are organisms involved in composting? The composting process relies on a variety on organisms that feed on the organic matter. Therefore factors that influence these organisms can affect the final compost product. By understanding the biology of composting, it is possible to manipulate processes, maximise the rate of decomposition and meet quality standards for final product. Many of the organisms involved in composting need aerobic conditions. How aerobic the conditions are is influenced by factors such as such as moisture, temperature, frequency of turning and the size of the pile. Also the quality of the organic matter at the start of the composting process also affects the organisms, especialy the pH and carbon to nitrogen ratio of the organic materials. Question 13. What happens during the composting process? The initial mesophilic phase involves microorganisms consuming readily available compounds. Heat is produced as a by-product of this activity, the amount of which will depend on the size of the pile and food available. This heat is important for the elimination of pathogens and weed seeds. In smaller piles (less than 2 m²), much of the heat is lost to the atmosphere hence the required temperatures may not be reached. The thermophylic phase begins around 45°C and this stage has the highest rate of decomposition. Above 65-70°C, many organisms die off and the pile will require turning and maybe watering to encourage organisms to build up again. One way in which to test the maturity of compost is to test temperatures, a fully composted material will not readily reheat. Question 14. What is compost "maturity" and why is it important? A mature compost is one in which the rate of decomposition has decreased. ﻿The maturity of a compost is important because applying immature compost to soil can lead to the immobilisation of nitrogen in the soil. This process could make nitrogen less available to plants. Most compost producers should be able to advise you on the maturity and qualities of their products. One way you can test the maturity of a compost yourself is by giving it suitable conditions to continue decomposing and observing whether is heats up. If it does not heat up, it is likely to be mature. Question 15. What are the main types of compost and what are their benefits? In general, composts can have many benefits for soil fertility including modifying pH, absorbing pollutants and excess nutrients, controlling erosion, buffering temperature, suppressing weeds and providing a source of essential nutrients (major and micronutrients). Composts can be applied to soil in two main ways and composts for each use have different properties and benefits for soil fertility. Composts can be used as mulches spread on the soil surface. Compost mulch products help to decrease irrigation needs because the water holding capacity of the soil is increased and evaporation is decreased. Composted material also helps buffer soil temperatures and can keep weeds down and reduce wind/water erosion. Mulch composts tend to have larger particle sizes than compost that is suitable for incorporation into soil. The mulch composts also contain more woody material. They have proven beneficial in commercial vineyards and orchards, at rehabilitation sites and in gardens. Composts for incorporation into soil can vary greatly in their qualities. Some are high in nutrient values and can be used to supply plant nutrients. However, immature composts can lead to problems such as nitrogen draw-down (or nitrogen immobilisation). Therefore, it is important to be careful where and when you apply them. Incorporated composts build organic matter within the soil bringing with them improvements to soil quality. Question 16. How does composted grape marc affect soil microorganisms? In viticultural regions, the harvest waste (or grape marc) poses a significant management problem for growers. It is because of this that many growers have been informally composting grape marc and applying it under-vine as an organic mulch. A field trial near Busselton in Western Australia measured changes in soil biological fertility following the application of grape marc on the ground under vines. The grape marc was applied at 60 tonnes/ha and at 120 tonnes/ha. 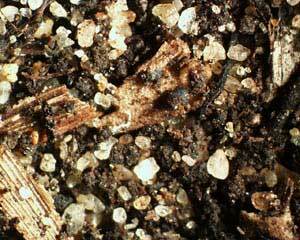 The quantity of microorganisms in the soil (microbial biomass) were assessed at a later time. The study found that 8 weeks after application of grape marc, the quantity of soil organisms (microbial biomass) had almost doubled and at 16 weeks it was three times greater. Both quantities of grape marc had the same effect. The soil microbial biomass plays a significant role in organic matter turnover and nutrient cycling. Therefore, increases in microbial biomass may lead to improved nutrient cycling and increased soil biological fertility.